Flat bread has become my new best friend when it comes to school lunches. It allows me to make a homemade pizza in the same amount of time it takes me to do a regular sandwich. 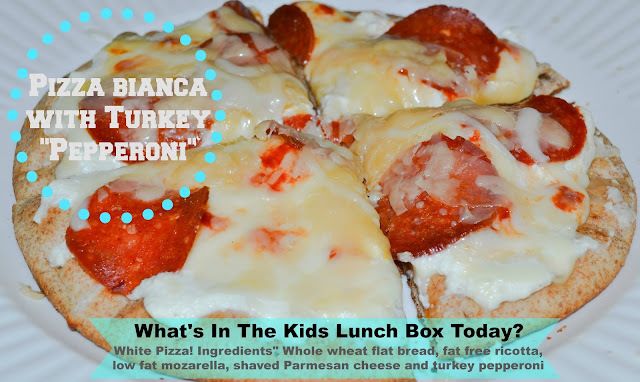 Today we are sending pizza bianca (white pizza) to school. I absolutely adore this. It tastes sooo good. 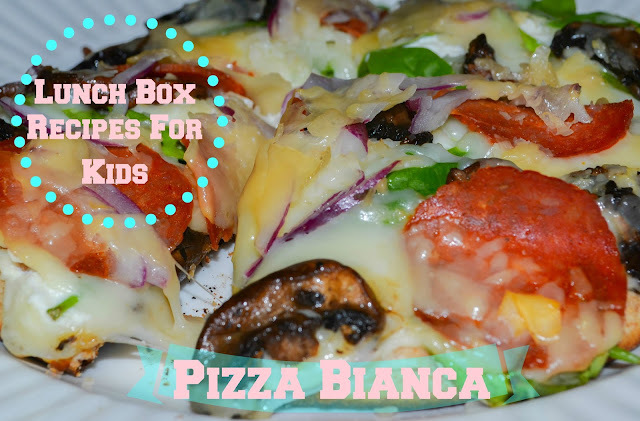 All you have to do is spread some ricotta cheese (fat free or reduced fat) on the flat bread, add low fat mozzarella cheese and shaved Parmesan, and add your favorite toppings. Some people like to add minced garlic, or a little or oregano on top. There are several ways to melt the cheese. You can either put the flatbread pizza in the oven or you can put it on a non-stick skillet, and put a lid so the steam can melt the cheese. This is the type of recipe that literally takes 5 minutes from start to finish. Another variation of the pizza that I absolutely love is adding prosciutto, figs, and honey. Sounds crazy but it's actually delicious. Great lunch for fall! My 11y/o likes to add turkey pepperoni, or crumbled sausage, while my daughter loves adding spinach, red onions and sun-dried tomatoes. So there you have it. This is "fast food" done right.